Revolutionary KineMAX is targeted very high quality film/video delivery including real 4K delivery. Its max capturing resolution is 6K with 14 f-stops; it also can record 4K, and even 4K 4:3 Anamorphic; golden 3K/2K, 1080p, with very high latitude up to 16 f-stops. For slow-mo, it can capture 4K slow-mo at HiSpeed mode up to 100fps (S35 frame size), and S16 2K Wide to 225fps. For such powerful function, its body remains very compact, and integrates battery plate, only 2cm longer than KineMINI. KineMAX™ is 444 or 422? bit depth is 12bit? and What's the latitude? KineMAX™ Records three RAW formats as KineRAW(.krw), CinemaDNG and Cineform RAW mov online. These codecs are very high RAW images; for RAW clips, there is no color sampling at all, equivalent to RGB444. Why calling KineMAX™ Binning 3K as Golden 3K? Real resolution is 2K: Recovering R/G/B from Single-chip CMOS by debayer: Effective resolution will be 3K*0.7=2.1K>2K; equivalent to RGB 3-chip 2K CCD sampling. Much lower data bits: Compared to 4K or 6K capturing and recording, it demands much lower speeds to SSD. Recording 3K, KineMAX can do it as Cineform RAW mov online, data bits is around 50MB/s. Saving SSD and benefit for DIT, data copy and backup. That’s why we call KineMAX Binning 3K as golden 3K. What is the recording formats of KineMAX? And how about the bit rates? Note: 4:3 Anamorphic is included in every KineMAX. Yes. KineMAX is capable of slow motion capture (overcrank), especially KineMAX featuring HiSpeed mode which enable 4K/2K slow-mo up to 100fps at S35 frame, 3K Wide 150fps@M4/3, and 2K Wide @225fps at S16 frame . It also supports crop mode to high fps. 16mm (Crop Mode), 2K Wide up to 110fps. All the Slow-Mo recordings do not have limitation on recording time. For 6K Option, What resolutions does it include? Can use free KineStation to transcode KineRAW(.krw) and CinemaDNG into 6K Cineform RAW mov, RGB444 mov. For HiSpeed mode, it is captured in S35mm, M4/3 and S16 framing, and there is no recording time limitation, until SSD full. Yes. KineMAX is capable of quick motion capture (undercrank). As of undercrank/Quick-Mo, the lowest fps is down to 6fps under current firmware. You can set any custom sensor fps between lowest and highest fps, the accuracy is 0.001fps, while recording fps is set by project fps in the camera. It provides much more possibilities over fixed fps like 24, 25, 30fps. KineMAX™ suffers from Rolling Effect? How does it compare to DSLR Camera? KineMAX employs a state-of-art 6K S35mm CMOS sensor. It does suffer from some rolling effect. If you want to take action shots, KineMAX features Sport/HiSpeed mode which reduces rolling effect greatly, seems like global shutter. Sport/HiSpeed Mode is designed to alleviate the rolling greatly, and make KineMAX handle quick movement shootings, like handheld, shots on shoulder, documentary style. The footages would be turned into Cineform RGB444 mov after KineStation transcoding. Note: Sport/HiSpeed Mode takes effect only on 2K and 4K, not 6K and Golden 3K. And it reduces the latitude a little bit and more aliasing. KineMAX™ image sensor is full-frame? How about the conversion ratio if use DSLR camera lens? It is a S35 frame size, like most mainstream S35 Cinema cameras. Its active frame size is close to APS-C, so its conversion ratio is close to APS-C camera too if you use DSLR lens. Besides, you can purchase Mounting adapter with KineEnhancer, so that KineMAX turns into Full Frame cinema camera. What's the frame size at 1080p or 2K or 3K or 4K? It is only Crop mode? Cropping, means M4/3 or S16 framing, there also are 4K/3K/2K is cropped from 6K@S35mm. There is also a HiSpeed M4/3 for KineMAX to get more higher fps on 2K. How about monitoring on KineMAX? Is there SDI port? KineMAX features one high definition display ports with industry standard: 1080p or 720p: you can set the monitoring resolution in-camera. Yes, there are dual SDI monitoring outputs option. Two SDI and one HD display ports can provide sufficient monitoring paths and meet the demands for EVF, field monitor, and DP monitor without need any other splitter nor converters. The SDI option is included in standard package and professional package. What mount does KineMAX have? It supports electronic EF lens? What is KineMOUNT™? Native Active EF, supports in-camera Iris control over majority of EF/EF-S lens; display Iris number and tune Iris number electronically. And even the EF mount is a Cine-Style mount, not DSLR type. This type of lock-style EF mount can be regarded as Cine mount, like PL mount which is very different from the fastening way of DSLR camera. Please visit How to use new lock-style EF mount to learn more. Note: EF mounting adapter support Iris control, while Nikon F mounting adapter not. Besides, mounting adapters are independent accessories, not included in machine body. How about the new lock-style EF mount or adapter? Kinefinity has employed whole new Cine-Style/lock-type EF mount, new lock-type EF mounting adapter, new lock-type Nikon F mounting adapter from 2014 Jan. Its fixing way is very similar to Cine PL mount: lock ring rotation, not lens rotation to make sure EF lens locked firmly and to be contacted well with pogo-pin contact inside of EF mount in any case. Compared to traditional lock way based on spring metal, the new EF mount gains much better stability; fits very well in professional way when video shots using follow-focus gear. KineMAX™ can playback? The color is only LOG when playback? It CAN playback based on your project fps setting, typically it runs as 25fps. Color shown when playback is based on LUT you chosen: Neutral or Flat . Generally, it records in LUT of Neutral. How does KineMAX™ record audio? KineMAX has in-camera MIC and supports KineAudio which is external professional audio recording module with Phantom 48V and XLR ports. It will generate two independent uncompressed wave files. If record format as Cineform RAW mov, KineMAX will embed the audio track into mov file. You can use KineStation to integrate audio files with DNG/KRW into Cineform RAW/RGB444 mov. KineMAX™ has fan? How about the fan noise? Yes, it has fan inside. KineMAX has two in-camera fans to cool the camera itself and make camera work well in stable condition. Fan generates noise. You can choose Record Stop in Fan setting to make one fan stop works temporarily: Fan works when live view; Stops when recording begins so that it is totally quiet when recording. It is very important in quiet environment, and sensitive to any audible noise. Pay attention to camera temperature indicator if recording Cineform RAW. DSLR rigs can be used on KineMAX? As long as general accessories with 15mm rod, they could work with KineMAX probably, like Matt-box, follow-focus, etc. Studio, Use external broadcasting battery like V-mount SONY battery to power KineMAX by a special D-Tap cord. KineMAX has a push-pull port with 2-PIN, wide voltage range input, from 6V~18V. For a 14.4V broadcasting battery with 130Wh, it can power KineMAX SIX hours. Also there is AC-DC adapter to power KineMAX directly. Steadicam, KineMAX can be powered directly from Movcam Steadicam by a special power cable. Customized, Even you could DIY a power cable to power KineMAX based our power cord with open ended. 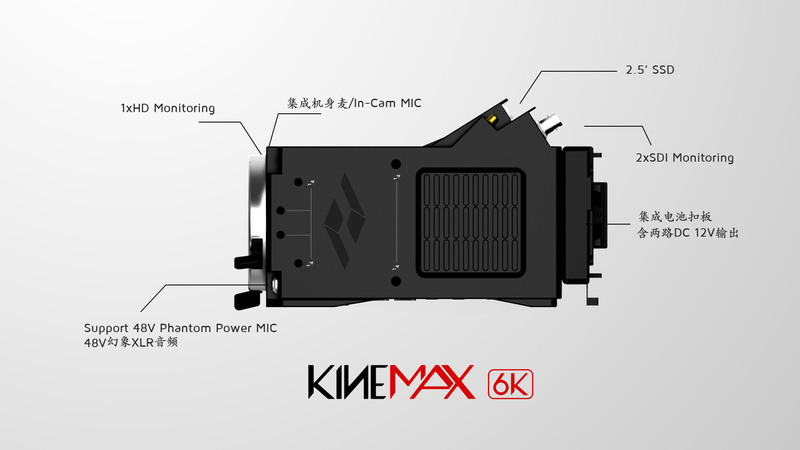 KineMAX 6K Option: The option can enable following recording as: 6K, 6K Wide, Golden 3K and Native 4K 4:3 Anamorphic。Record format as KineRAW(.krw). It does not need to return Camera back to factory to upgrade the option so that you can purchase it and upgrade it after you bought camera. KineMAX HiSpeed Option: The option can enable following recording as: 4K wide slow to 100fps, 2K Wide to 144fps. Record format as KineRAW(.krw). KineMAX Battery Plate Option: KineMAX provides integrated battery plate, you can choose SONY V-mount or Anton Bauer Mount. It reduces the connections between camera body and battery, and reduces possibility of power failure. Large Broadcasting Battery located at the back end will help balance when shoulder pack. Besides, camera body output two extra 12V, 1A DC outputs to field monitor or EVF. Dual 3G SDI Monitoring Option: supports SDI monitoring output for broadcasting monitors, the resolution is same as HD display output as 1080p or 720p. 3D SYNC Option: KineMAX can take real 3D shots. Just one SYNC cable to connect two KineMAX SYNC port, set up Master and Slave instantly. 3D SYNC means: Scan sync, frame sync and time code sync, less than 5uS of mismatch! Power cord: D-Tap to Power Cord. More Third-party high quality accessories，like professional wireless monitoring solution, De-noise software, Resolve Tutorials, etc. KineMAX™ can use other brand SSD? Is there any recommendation list? KineRAW cameras do not prohibit users from using third-party SSD. Users could try to use third-party SSD, but generally speaking, third-party SSD are consumer-type, often using MLC flash memory chip even TLC memory chip. As known, MLC and TLC suffers from stability and much lower durance, compared to SLC Flash. KineMAG employs high quality SLC flash memory chip. Only KineMAG SSD is recommended. KineMAX has EVF or monitors on camera? Alphatron EVF and Cineroid EVF4C are recommended. What kind of Steadicam for KineMAX™? Typically, Knight D100 from Movcam is OK. Knight D200 is preferred. KineKIT is designed, made specifically for KineMAX by Movcam. It is a basic KIT, that means do NOT including Matt-box nor Follow-Focus. It features lightweight and robustness, and is compatible with any accessories with 15mm rod system. Its price is just US$ 699. Workflow base on Cineform can not be simpler: Edit and Grade directly on footages, realtime, no need proxy. Yes. Just need to install Cineform Studio/Studio Premium as Cineform decoder plugin. Suggest to install Cineform Studio Premium, even a trial version. CinemaDNG is uncompressed RAW format, frame-based, just like Film. In terms of motion pictures, it is a frame sequence of 24 uncompressed 6K RAW images.. Adobe software including AE, Speedgrade, and other DI softwares like Davinci Resolve can grade CinemaDNG natively, and latest Premiere CC, Resolve can edit CinemaDNG sequences. What is file system format of KineMAG™ SSD? How to format it, read clips from KineMAG SSD? You can configure your KineMAX based on your current Lens, Accessories, monitors and Budget, because KineMAX adapts general display ports, wide range input voltage, and mounting options. This entry was posted in Downloads, FAQ. Bookmark the permalink.